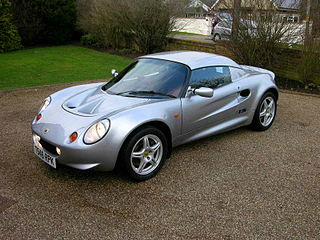 Originally, in 1994, the Lotus Elise sports car was projected as a two seater, mid-engined, low production convertible. It featured a fibreglass body on a lightweight aluminium spaceframe chassis, together with a galvanised steel subframe which supported the engine. It was powered by an all aluminium Rover K-Series, 1796 cc, 4-cylinder, 16 valve, double overhead cam engine. Fitted with fuel injection, it developed 118 bhp at 5500 rpm, and 122 ft/lbs of torque at 3000 rpm. With its high power-to-weight ratio, it produced a top speed of 126 mph, with a 0-60 mph time of 5.8 secs. 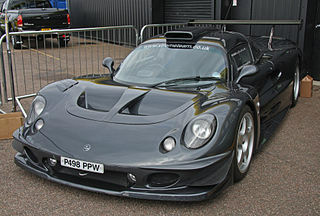 The Series 1 Elise was launched in 1996, and was designated the Type 111. Elisa, the granddaughter of the chairman of Lotus and Bugatti, leant her name to the Elise. Julian Thomson, head of design at Lotus, was instrumental in the car's styling. It had independent suspension all round, a five speed gearbox, and disc brakes fitted on all wheels. With the passenger's seat fixed, the adjustable driver's seat was positioned near the centre of the car, so maximising peripheral vision. Introduced in 1997, and designated the Type 115, the Lotus Elise GT1 sports racer was powered by a 3506 cc, twin turbo, V8 engine, developing 580 bhp at 7500 rpm, and 288 ft/lbs of torque at 6500 rpm. With a body made from carbon fibre on an Elise spaceframe chassis, and fitted with a Hewland six speed gearbox, it had a top speed of 195 mph, with a 0-60 mph time of 3.8 secs. It used vented disc brakes all round. At least one GTI sports car was built in a street legal format. 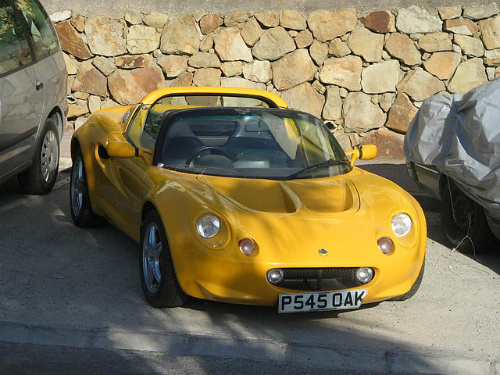 The Lotus Elise Sport 135 sports car was introduced in November 1998 as a limited edition of 50 units, and its Rover K-Series engine was modified to develop 135 bhp. It was fitted with a close ratio gearbox, sports exhaust, stiffened suspension, drilled disc brakes, metallic silver paint with a blue tinge, sports seats, roll over bar, and distinctive Sport 135 body graphics. In 1999, additional units were built which featured Elise 111S wheels, and "Sport 135 99" logos. The 50th Anniversary Lotus Elise was a limited edition variant of just 50 units, based on the standard Elise. Introduced in late 1998, the wheels were gold coloured, it had leather seats, but the sole colour was green. With a designation based on the Elise Type 111, the 111S was originally given the name Elise Sprint. It was launched in early 1999 at the Geneva Motor Show as the Lotus Elise 111S sports car, and turned out to be the most popular of the uprated Elise models. It was powered by the 1.8 litre Rover K-Series Variable Valve Control (VVC) engine. The VVC addition helped produce better breathing at higher revs. Coupled with a modified cylinder head, it developed 143 bhp. This engine variant gave rise to a wider and smoother power band. With a close ratio gearbox and lower ratio final drive, it had a top speed of 133 mph, produced a 0-60 mph time of 5.4 secs, and a 0-100 mph time of 14.4 secs. It featured wide rear tyres, disc brakes all round, a rear spoiler, a grille that looked like an egg crate, uprated springs and dampers, six spoke road wheels, and optional 111S logos. In August 1999, the Elise 111S sports car was replaced by the Lotus Sports 160, which developed 160 bhp. The Lotus Elise Sport 160 sports car was launched in February 2000, and featured an uprated Sport 135 cylinder head, and a new camshaft and EFI engine management system. Fitted with a catalytic converter and Sport exhaust, it developed 160 bhp at 7000 rpm, and 178 ft/lbs of torque at 5000 rpm. Many regarded this model as the best Series 1 Elise. In June 2000, the Elise 111S was phased out and replaced by the Sport 160 and Sport 160S, of which the later was fitted with sports suspension, a close ratio gearbox, and a taller rear wing. Each was fitted with five spoke race wheels, either six or eight inches in width. In July 2000, a kit was offered to increase the output of the engine to 190 bhp, as in the Elise Sport 190. 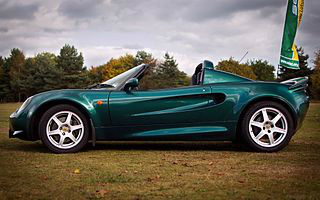 A 1999 Series 1 Lotus Elise 111S in good condition would fetch around £11,000/$18,000, whilst a 2000 Lotus Elise Sports 160 would command around £13,000/$21,000, and a good example of a 1998 Elise Series 1 would reach £10,000/$16,000.